I have become a real big weather buff over the last couple of years. I have a Davis Vantage Pro2 station on the roof. All of my data is live on the Internet at www.redfieldweather.com and the Weather Underground at, http://www.wunderground.com/weatherstation/WXDailyHistory.asp?ID=KMINILES3. I bought the Davis Vantage Pro2 a couple years ago now, and last year I added a Boltek Lightning detector. That data is also pushed to my web site and to StrikeStarUS. This picture is of my weather station computer and you can also see my FT-8900R radio along with the HRI-100 that connects it to WiRES-II. The top monitor shows my lightening data and WASP2. 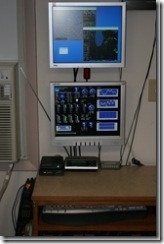 WASP2 is an application that displays data from StrikeStarUS and also display Doppler RADAR images. WASP2 creates the main image on the top of my web page at www.redfieldweather.com. 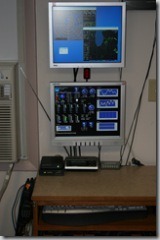 The bottom monitor displays all the data collected from the Davis Vantage Pro2. The software is Virtual Weather Station, not the coolest looking software but it does give me a lot of data and a lot of images that can be used on my web site. 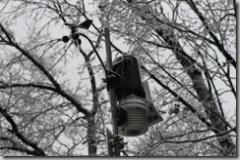 Here is a very cold picture of the weather station in the ice we had earlier this year on 1-15-2007. I also have a weather radio on my desk that is streaming the local NOAA weather radio to the weather underground. You can listen to the stream here. The weather radio also has an LED strobe attached to it, so when there is a weather alert the LED will flash. My wife makes fun of me, but I think all this is cool. I love computers and stuff that can connect to them. Not a cheap hobby but a fun one none the less. I was wondering what happened to your weather station the past few days. You’re right up the road from me, so its very accurate and I love the fast updates! Yeah, sorry the software crashes on me at times. I need to add some monitoring software. I miss the weather page. Are you planning to get it up and running again? I’m your neighbor on Gumwood. It should be working, let me know what problems you are having. Need to redoo it. 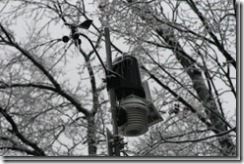 What was the cost to set up your weather station and software? I paid about $1,700 for everything and that is including the Lightning Detector.